Who doesn’t love the texture of crispy and sweet? These M&M Peppermint Pretzel Kisses are a delicious treat to make and share with the ones that you love! There are few Valentine’s Day treats that are so simple, they’re perfect. It seems like everyone tries to go above and beyond in making elaborate treats that take a ton of time and effort these days…and while those are nice, isn’t it also the thought that counts? 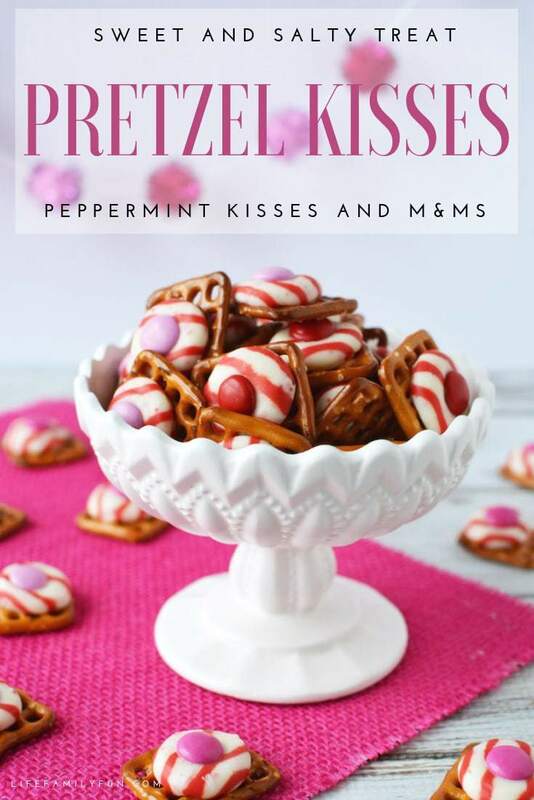 These Peppermint Pretzel Kisses are quite perfect for Valentine’s Day because they’re simple, delicious and easy to fall in love with. The trick to making a delicious sweet treat? Make one that you want to taste test as well! Anytime that you’re passionate about what you’re cooking, the love comes through in the taste. 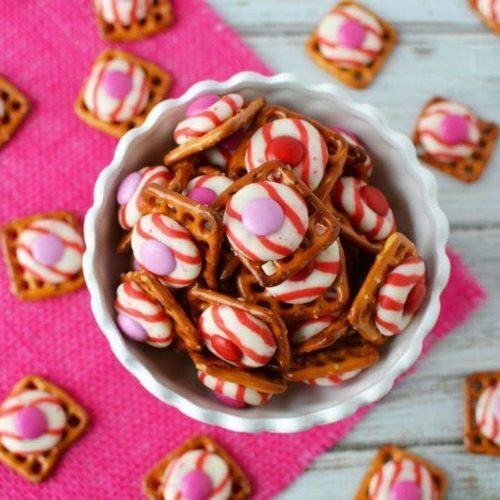 This Valentine’s Day, these Peppermint Pretzel Kisses need to be the star of the show. Super simple and easy to do, these are perfect for a Valentine’s Day party, or as a simple dessert to end a busy day full of love. The good news? This recipe makes more than enough to share so have fun gifting the gift of love to all your family and friends. 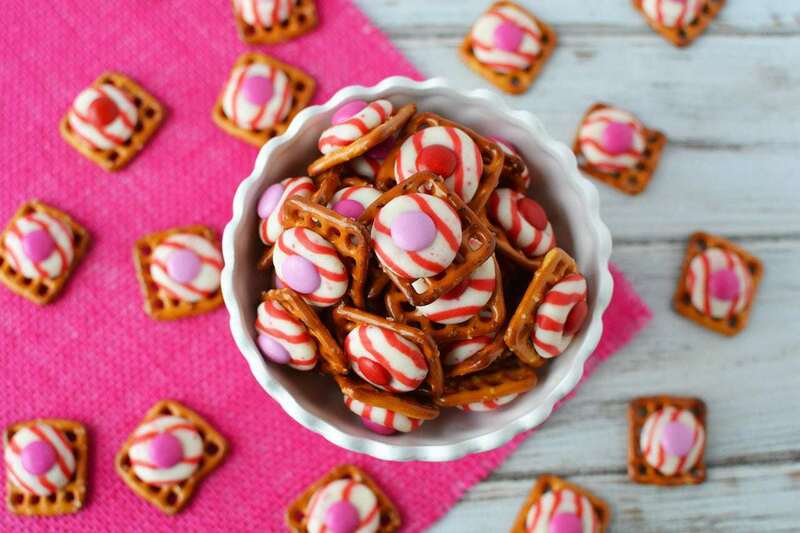 What other flavors of chocolate kisses could you use in these Peppermint Pretzel Kisses? 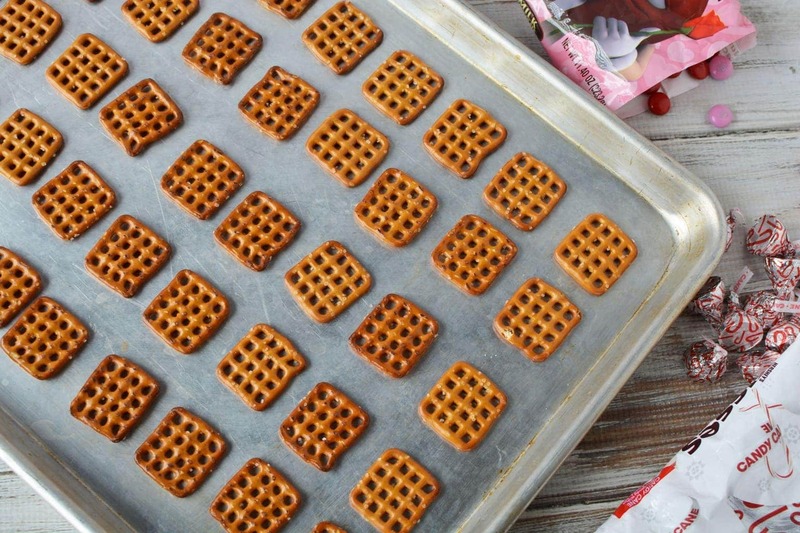 Do you have to use waffle style pretzels for these simple pretzel desserts? Who says that delicious recipes have to require a ton of baking and time? These simple Valentine’s treats take mere moments from start to finish and are worth every bite. These sweet treats can actually be made during any time of the year with ease as well. All you need to do is change out the flavor of the chocolate kisses and find festive colored M&M’s to top it and you can easily make these for Easter, Christmas and even Halloween! 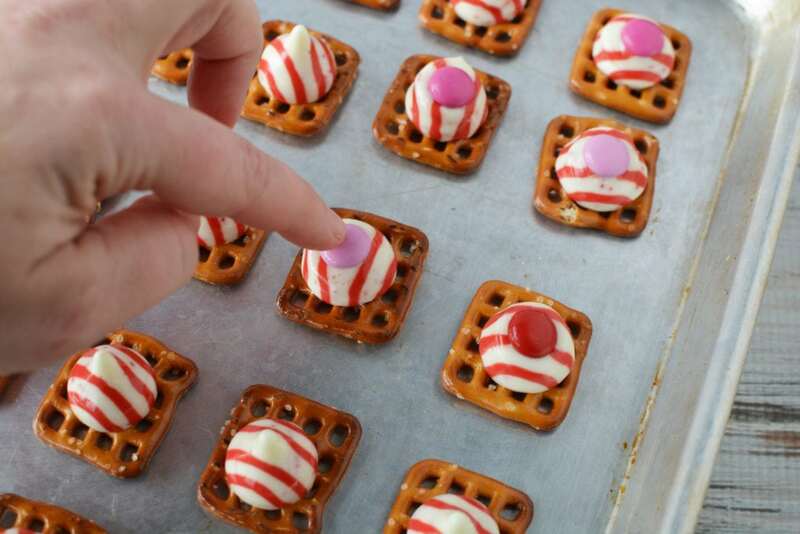 Year-round pretzel kisses treats? Yes, please! The sky is the limit! Whatever your taste buds want, you can use. Peppermint kisses work great for Christmas and Valentine’s Day, but there are also so many other chocolate kiss flavors. If you need to, experiment! You can taste test your way to find the winning combo! You actually don’t. As long as you get pretzels that are flat enough to have the kisses set on top, you can use any type of pretzels that you want. The waffle-style ones are probably the easiest to use, though just because of their wide base and flat top. You seriously won’t find a more simple Valentine’s Day treat that this pretzel dessert! 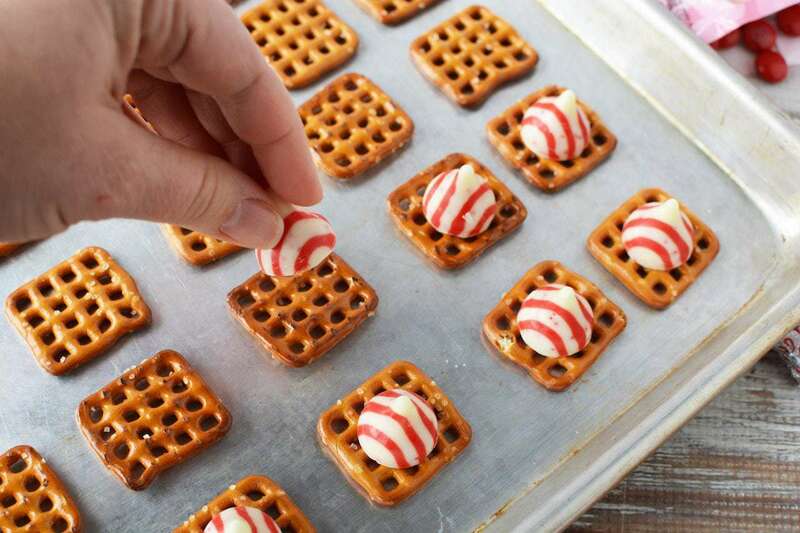 All you need are three simple ingredients and a little bit of time and you’ll be snacking away on these Peppermint Pretzel Kisses in no time at all! Who doesn't love the texture of crispy and sweet? These M&M Peppermint Pretzel Kisses are a delicious treat to make and share with the ones that you love! Place pretzels on baking sheet. 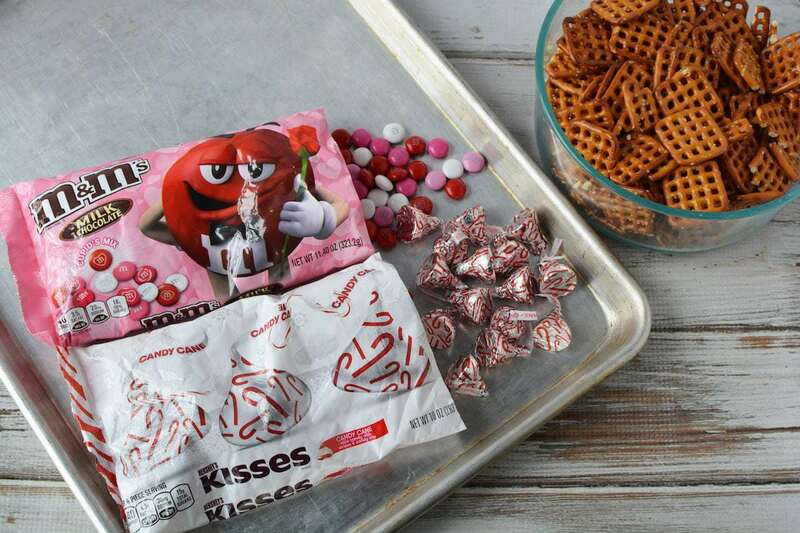 Unwrap all of the kiss candies and place one candy on top of each pretzel. Bake for 1-2 minutes or until kiss is shiny and soft. Remove from oven and gently press M&M candy into center of kiss to flatten it slightly. Set aside to cool completely or refrigerate for 1 hour until candies are hard. Store at room temperature in an airtight container.